These shears are the answer to wet/dry shear cutting, shear over comb, slide cutting and more! The shears have a 90 day damage warranty & a Lifetime warranty on sharpness! Dont be left behind....cut your way to the top with precision & time efficient accuracy! 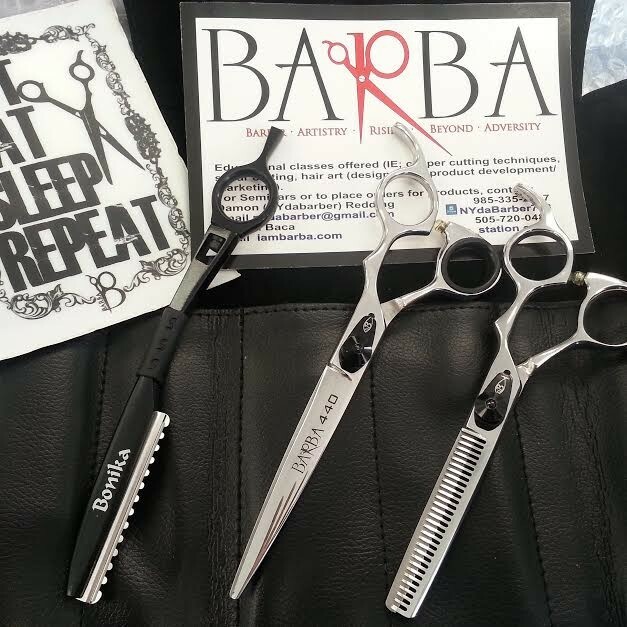 THE BARBA 440 WET/DRY SHEAR and THE BARBA 440 SAHARA are sold together as a set. They are the ideal shear for Barbers & Stylists. Both offset shears are made from 440C Japanese Steel, have a BARBA/Bonika customized Hamaguri Razor Edge and a Diamond Serrated Tip for Dry/Wet Cutting. Both shears have the "still" blade DIAMOND SERRATED and the "moving" blade has a HAMAGURI RAZOR EDGE for dry cutting. Both shears are available in 5.5 ,6 ,6.5 in and 5.5 in left handed as well. The Shears are sharpened by Mr. T. Lau, Bonika's master sharpener of 2 decades! These shears are the answer to wet/dry shear cutting, shear over comb, slide cutting and more! The shears have a 90 day damage warranty & a Lifetime warranty on sharpness! Dont be left behind....cut your way to the top with precision & time efficient accuracy!